Items 1/2. Welcome/Apologies (as above). Chair Betty Wright opened the meeting, welcoming everyone to the first meeting in 2019. Thanks were expressed for the award of £200 from THC Ward Discretionary Fund which will allow for this and the next meetings to be held. The CC greatly regrets that funds from this small budget had to be accessed to make up for the loss of funding caused by the cut to the annual grant. Item 3. Minutes of last meeting. The minutes of the December meeting were approved as a true and accurate record, proposed: Andy Wright; seconded: Marion Turner. Item 4. Matters arising. (1) Secretary has written to Graham MacKenzie, Head of THC Roads Dept, regarding the transport plans for construction traffic during the building of the new pier in Invergordon. Issues with lorry traffic arose the last time stone was being moved from Ardchronie to CFPA on the circular route using the B9176 Struie road and the A836 Tain to Ardgay. There has been no agreement on this. Mr MacKenzie advised that the letter of concern had been passed forward appropriately in the Inverness office but to date there has been no reply to the CC. MT Action. (2) Tree planting on Jubilee Hill. In October 2018 representatives from the public attend the CC meeting at which Chris Gordon, Factor, Balnagown Estate, outlined plans for replanting on the hill. Revised plans were issued in December. A public meeting with Forestry officers took place last week which did not resolve any issues concerning land use. Local residents wrote to the CC and their letter of complaint has been forwarded to Nick Richards, THC. No response so far. CC will submit its objections ahead of the deadline, based on the strength of local feeling. Many issues were raised from the floor including the misleading and inaccurate information on the FCS website, the strong opposition locally and from the wider community, inadequate timescale allowances for objections/approvals, lack of communication and clear information, and the process followed by FCS in reaching this stage. GR and KC will enquire. The CC stressed its role of representing all views in the local community and that it supports tree planting in appropriate areas. BW/MT/GR/KC Action. (3) Recycle bins. The road surface within the industrial estate is in very poor condition with many deep potholes. THC has no funds to repair. A local contractor had previously made an offer to one of the businesses at the industrial estate to resurface the area, but this offer was not taken up. CC will enquire if the offer still stands. It is essential that the bins are returned to this area. BW/KC Action. (4) Local Community Plan. This has been circulated. No further comment made. (5) Croick Church maintenance. Mary Stobo, Session Clerk, advised that the Church is in consultation with various bodies seeking assistance to look after the church building. A full survey has been done by an architect, a major refurbishment was carried out in 1980s and maintenance/ painting etc is done on a regular basis. A professional survey is done by the Church of Scotland every ten years. A bow in the roof is not expected to lead to a danger of collapse. Trees are an ongoing issue with a dispute as to whether they belong to the church or THC. The pine trees are now so old they could easily come down in any bad storm; there is no tree protection order in place. The viewing platform for the etched window is rotting and in need of replacement. The local Heritage Society has also offered to help publicise the church which is open every day, an annual communion service is held and a summer service once a month on the second Sunday, May– September. The building enjoys an international interest, is part of the Clearances Trail and part of the Telford Trail, as a testament to the strength of the local people at that time. It should be preserved and maintained as fit for purpose for occasional use. Various ideas are forthcoming to promote the church more widely as a cultural tourism venue. CC applauded the work being done and will support in any way possible. MS was warmly thanked for bringing the matter to the attention of the CC and the public. Item 5. Police report. The police report was received by email after the meeting along with apologies that duties had made it impossible for an officer to attend. In the last month there were fourteen reported issues: two communication calls, three advice calls, three road traffic matters, two false calls, one fraud, one loud music call, one fire and one sudden death. Item 6. Chairperson’s report. (BW) BW wished to bring to members’ attention two grass roots environmental organisations taking actions recently. Strike action is being taken every Friday by school children in Lochaber and Ullapool High Schools in an attempt to help highlight the issues of climate change. This action is being taken nationally, highlighting ‘There is no Planet B.’ A Junior Shark Ambassador has been appointed from Ullapool. The CC appreciates the efforts being made, though difficult to support the lost education hour. Another group is ‘Extinction Rebellion’ which has been organising actions throughout the UK to raise awareness of our global emergency due to climate breakdown and biodiversity loss. An agenda item will be listed at the next meeting to discuss the issues further and perhaps ask THC to declare a Climate Emergency. GR advised that the Scottish Government has a Stage 1 debate due with a Transport Bill dealing with emissions legislation. Agenda item. BW Action. Item 7. Secretary’s report. (MT) All relevant correspondence has been circulated. Electronic information signs are to be installed at Ardgay Station and a Request Stop push-button system will be in place at Culrain Station. Secretary will write to Frank Roach to ask if the fall in passenger numbers at Culrain since 2015/16 is due to the change in the 06.18 train from Wick which no longer stops by request at Culrain. MT Action. Item 8. Treasurer’s report. (MT) The 25th January balance at the bank is £17,230.31 of which £16,946.75 are restricted funds. The healthier balance in the CC Admin fund is due to a successful application for £200 to the Ward Discretionary Fund giving a balance of £161.02. It is hoped that this may cover CC admin costs for the rest of this financial year. Regret was again expressed at having to apply to this source. The Windfarm Admin Fund has a balance of £122.54. The balances of the restricted funds are: £44.70 -Toilet Caretaking; £1,516.42 -BTWF Community Projects; £2,201.25 Newsletter; £13,013.98 – Beinn nan Oighrean; £170.40 – E.ON Path. Item 9. Correspondence/matters raised by local residents. (1) A Health & Wellbeing Partnership meeting will be held in Tain Royal Academy on March 28th at 7.30pm. Everyone was encouraged to attend if possible. (2) GR advised she is seeking information regarding Mental Health Service issues in the area. KC confirmed that THC has agreed a motion to be ‘trauma informed’ regarding ‘difficult behaviour’. Better understanding is sought of mental health problems in children from an early age; understanding is an issue in schools believed to be worse, and often hidden, in Sutherland. (3) A Flood Forum is to be held in Perth, date not yet available. (2) Newsletter. The Spring edition of the newsletter will be out for delivery around the 15th of March. The copy date for contributions to this issue is Thursday 21st February. There are still funds to produce a Summer and Autumn edition. The Editor, SM, has had further talks with David Watson, Kyle of Sutherland Trust Manager and David Knight, from Business Gateway, who are helping to develop a 5-year plan. The intention of the editor is to create a separate entity, possibly a limited company, which will continue publishing the magazine even in the event of no Community Council being formed in the future. Public funding will be obtained through the Kyle of Sutherland Development Trust. In this new stage, the newsletter will enlarge its scope to cover Creich CC area, which will allow also for more revenue from advertising. 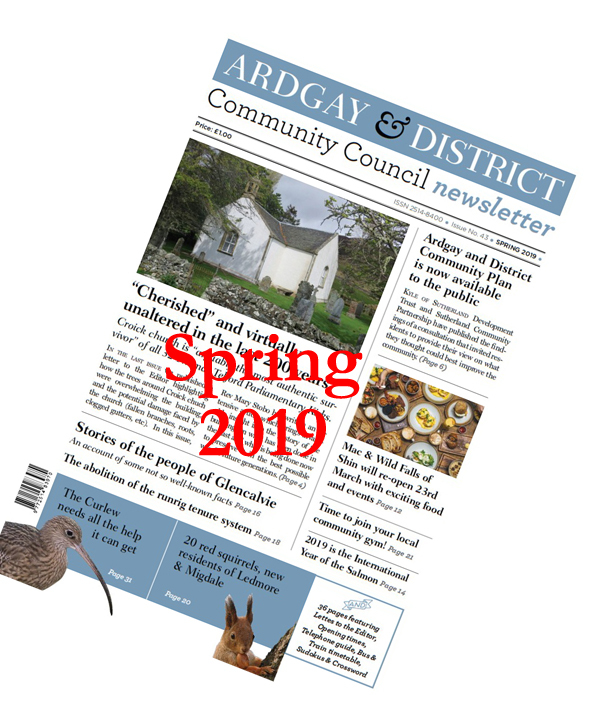 The Editor wished to reassure Ardgay & District Community councillors and residents stating that the format will be very similar, there will be pages for CC business and, if the CC still wishes to do so, it can obtain copies that can then be distributed for free using the same voluntary distributors. It was agreed to discuss the matter further at the next CC meeting. Agenda item. BW Action. (3) Kyle of Sutherland Development Trust. AGM is planned to take place in April, date to be confirmed. Item 11. Highland Council (KC) Budget discussions taking place this week. Chair expressed the CC wish to be able to return to holding ten meetings per year. This was reduced to eight and is now only six due to lack of funding by THC. There is much concern that without proper funding, the CC may well cease to exist, new people will not be encouraged to stand for election, due this November. Without funding, having no power and, increasingly it seems, little influence Community Councils across the region may well disappear. THC must listen to the CCs which do work and which hope to continue. KC advised that a new THC Chief Executive is now in post. Item 12. Any other competent business. None raised. Item 13. Date and time of next meeting. The meeting will be held on Monday 8th April at 7pm in Ardgay Hall. Item 14. Beinn Tharsuinn/Beinn nan Oighrean Community Benefit awards. Beinn nan Oighrean. At the private session following the main meeting application by Culrain & District Hall Committee for £210 towards replacement Christmas lights was ratified. This application had been approved by email decision during the recess period. Application by Ardgay Public Hall received an award of £250 towards the costs of renovation of the fire escape pathway. Secretary will amend the address shown on the form for postal applications. MT Action. Beinn Tharsuinn. Gearrchoille Community Wood Ardgay applied for £900 to help with running costs for 2019-20. The CC is pleased to continue support for this popular local amenity. All applicants and BTWF Company Secretary will be advised. MG Action. Items 1/2/6. Welcome/Apologies (as above)/ Police report. Chair Betty Wright welcomed everyone. The police report showed thirteen incidents comprising one domestic, one missing person – traced, two assistance to members of the public, one medical death, two public nuisance, two planned shoots/pest control, one alarm and two advice calls. The public were warned against a winter surge in petty crime, also to be aware of computer scams by phone or email which could access confidential information, bank details, etc. The regular drink driving campaign is underway as is usual at this time of year. Chair advised that she will contact Sgt Allan regarding the campaign to introduce a 40mph speed limit on the Ardgay-Bonar Bridge straight. BW Action. Item 3. Guest speaker: Alan MacIntyre, Energiekontor. AM began with a brief introduction to the company and its plans for the extension to the Lairg Windfarm. The company started in Bremen in 1990, has built 118 windfarms and currently operates 34. Office in Glasgow, opening one in Edinburgh and possibly one in Inverness. Two years ago, a 24-month bird survey on the proposed Lairg extension site began. The site is owned by Lairg Estate. Meetings with consultees such as MoD, NATS, SNH, etc took place in May of this year. In June presentations were made to Common Grazers, meeting with Highland Council and pre-planning application was submitted. July saw Phase 1 of the peat depth survey. In August meetings took place with various local CCs. The 24-month bird survey finished in September. Public exhibitions were held in Rogart and Lairg. In October the site design was finalised, and a presentation made to Dornoch CC. Further CC presentations/updates are planned in December. Planning application is expected to be submitted in February/March 2019 with more public exhibitions arranged at that time. As well as the bird survey, peat depth, ecology, aviation, noise, and shadow flicker surveys have all been undertaken. The access is planned to be from the Mound on the A9, via Rogart on the A939 to Lairg, then on the A836 to utilise the existing windfarm access via Torroble. Discussions are ongoing with CCs regarding community benefit. The company will offer the maximum of £5,000 per megawatt in line with government guidelines. A shared ownership scheme will also be established allowing local investment. AM will supply further information to be circulated to CCs leading to further discussion in the New Year. Item 4. Minutes of last meeting. The minutes of the October meeting were approved as a true and accurate record, proposed: Marion Turner; seconded: Silvia Muras. Item 5. Matters arising. (1) Locality/Community Plan, (see above). (2) Recycle bins. BT Openreach are due to inspect the overhead wire to the HUB to establish if it can be removed to allow the siting of the glass recycling bins in front of the Fire Station. (3) Tree planting on Jubilee Hill. CC will have an opportunity to comment in due course. (4) Ardgay/Bonar straight. See Item 6 at start of these Minutes. (5) THC Community Council Review. All CCs encouraged to complete the questionnaire individually and return to THC. At a recent meeting with Donna Manson, CEO, many CCs within Highland reported similar problems/issues. All have no cash. There is little appetite to accept any further responsibilities; CCs would like THC to listen and be more responsive. (6) Ardgay toilets. Facility now closed for the winter. Recent good meeting with Debbie Sutton, THC; possibility of keeping the toilets open 24 hours next season, assurance received that maintenance will continue, electric hand driers may be installed. Item 7. Treasurer’s report. (MT) The 26th November balance at the bank it £18,393.87 of which £18,186.26 are restricted funds. The CC Admin fund has a balance of £33.82 and the Windfarm Admin fund a balance of £173.70. This meeting will be the last which can be funded from THC Annual Admin grant. The balances of the restricted funds are: toilet Caretaking £50.31; BTWF – Community Projects £1,516.42; Newsletter£2,955.15; BNO £13,494.98; E.ON Path £170.40. Until further funding is received, future alternate monthly meetings will open and close at 7pm with an empty agenda. This will satisfy the requirement to hold six meetings per year. A closed session will take place to administer the community benefit funds; those discussions will be paid for from the windfarm admin fund. Concerns raised that the difficulties caused by the cut in finances may make it more likely that the CC may fail to form following the next election due in November 2019. Item 8. Chairperson’s report. (BW) Relevant items covered through the agenda. Item 9. Secretary’s report. (MT) All correspondence had been circulated by email. For future meetings if and CC member wishes to raise anything from the correspondence they should flag it up to the Chair before the meeting. Item 10. Correspondence/Matters raised by local residents. (1) All received emails have been circulated. (2) Winter Maintenance Plan received. (3) Trees at Croick Church. Editor has received a letter of concern regarding the overgrown trees which are damaging both dykes and the structure of the building. Some roof damage was mentioned. Church of Scotland is responsible for the upkeep of the building; THC is responsible for the trees. SM will liaise with the writer, also advise KoSDT as the building is a valuable asset as an historical tourism attraction. Heritage Lottery might be approached for window repair/restoration. SM Action. (3) Broadband. Highland Wireless is now connecting customers in Rosehall. (4) Windfarms. (1) Sallachy. Discussions on target to sign off agreement re community benefit. (5) Kyle of Sutherland Development Trust. David Watson, newly appointed as Trust Manager, introduced himself and outlined his priorities for taking the Trust forward. His main aim is to improve the communication between the community and the Trust as he feels that often the community learns about what the Trust is doing but not the reasoning behind decisions. He also hopes to raise more private sector income with sustainable projects which will allow the Trust to work better for the good of the area. He is encouraged by the excellent record of the Trust since its inception and the exceptional projects which have been successful. The two issues which are showing as being the most challenging are child care and transport, both of which will be given due attention in the coming months. CC agreed that two-way communication will be essential in moving forward and welcomed ideas such as a monthly Open Afternoon when the public can call into the office to discuss any/all relevant matters and ideas. Transparency and seeking to remove any mystery are top of the plans. Item 12. Highland Council. Nothing added to topics already discussed and noted elsewhere in these Minutes. Item 13. AOCB. (1) It was noted that Marine Scotland is planning an extension with another berth in Invergordon. This will entail thirty-six weeks when trucks will travel between Invergordon and Ardchronie Quarry making fifty-four trips per day carrying stone for the construction. Peak traffic times are to be avoided with loaded trucks using the bottom road to the A9 and returning empty via the Struie. Concerns raised regarding this increase in heavy traffic over the B9176 Struie road where the several bridges already suffer considerably from overuse by heavy vehicles. Secretary will write to Head of Roads Department, THC, Graham MacKenzie and will liaise with other local CCs which will be affected. MT Action. (2) Flow Country World Heritage Site. SM has been in touch with Joe Perry and has details of the proposals to be put forward in support of this application. (3) Christmas tree. All involved were warmly thanked for the supply and erection of this year’s tree in the village. This became a community event and was enjoyed by all present. There are no plans this year to use the lights which the CC currently has in store. Item 14. Date of next meeting. The next meeting will be held on Monday 11th February at 7pm in Ardgay Public Hall. As already indicated this meeting will have a strictly limited agenda. On conclusion, any windfarm business, applications, etc will be discussed. Beinn Tharsuinn/Beinn nan Oighrean discussion. Following the closure of the main meeting the private session considered three applications. Beinn Tharsuinn – The Friends of the Bradbury Centre application was awarded £500 towards music and alternative therapy sessions. The same awards had been approved by Creich and Lairg CCs subject to match funding from all three local CCs. Phil Tomalin, Company Secretary, and the applicant will be advised that full approval has been granted. MG Action. Beinn nan Oighrean. Application by Invershin Village Hall for £150 towards running bike maintenance sessions was approved. Application by Gearrchoille Community Wood Association was awarded £120 towards the costs of reprinting information leaflets. MG/MT Action. Items 1/2. Welcome/Apologies (as above). Chair Betty Wright welcomed everyone, especially the members of the public present to meet the guest speaker. Item 3. Guest speaker: Chris Gordon, Factor, Balnagown Estate re planting Jubilee Hill. CG began by introducing himself and MM. Chris has been in post for one year. The land proposed for planting is a 100-acre site more than half of which is presently regenerating as natural woodland of mostly self-seeded Scots pine. A map was passed around. Five power lines cross the area which also contains Core Paths. There will be no change to the Core Paths and the area around the Fort will not be planted. Recorded archaeological sites will be respected and unchanged. Native species, mostly Scots pine but with native hardwoods, will be used. The plantation is not a commercial one and is to remain in perpetuity. Planting density is to be 1600 per hectare which will not make a thick woodland. A 9-ton digger will create the mounds for each tree which will then be hand planted. This is expected to take about 2 – 3 weeks work. Access for machinery will be from the main road where the Core Path comes off the hill. From the floor strong objections were raised with fears that planting will be too close to the houses and sunlight will be blocked from November to March. MM stated larger buffer zones could be created to alleviate this problem with grading of trees by height from the edge of the plantation. Loss of amenity as views are obscured in time was also quoted as an objection. The next step is to revise the plan following this feedback and discuss further with the owners. A final plan will be submitted to Forestry Commission which would be followed by a formal 28-day consultation period. The CC will comment reflecting local opinions at that point. CG was thanked from the floor for providing this opportunity for discussion with the residents. CG and MM left at 7.55pm. The meeting reconvened after a short break at 8.05pm. Item 4. Minutes of last meeting. The minutes of the August meeting were approved as a true and accurate record, proposed: Marion Turner; seconded: Betty Wright. Item 7. Chairperson’s report – proposal to subsidise CC costs. (BW) All admin budget will be used by the end of this meeting. At discussion with Ward Manager Phil Tomalin, CC members made clear that an honorarium system for administration is no longer feasible. If THC was to pay an hourly rate for secretarial work, it would be probably a maximum of £10 per hour. The suggestion was therefore made to top up to the £15 per hour presently paid for this work from the windfarm community benefit fund. Chair will advise THC Cllrs and Ward Manager that the money has run out. Administration of community benefit and windfarm liaison work is now one of the most important parts of the CC work. The proposal to use BTWF funds and BnO funds to provide top up was agreed. Item 5. Matters arising. (1) Locality Plan, Martin Thomsen will attend December meeting to update. (2) Carbisdale Trails. Matt Dent, THC Core Paths Officer/Forestry Commission may help CC to find out if anything is happening. (3) Recycling Point. The bins have not yet been returned to the South Bonar Industrial Estate. (4) Ardgay/Bonar straight. Chair will write again re the proposal to introduce a speed restriction along the length of the straight as well as extending the 30mph limits at each end. Also check if the regulation covering distance between villages is still in place. (5) Speeding is again frequent past the school. People should take registration numbers and report to police, giving date and time, on 101. (6) VG-ES. No update available. (7) THC Community Council review. All CCs encouraged to make individual submissions. (8) TECS. Street light outside toilets is not working. To be reported via THC website. Chair will action all points. BW Action. Item 6. Police report. Report received by email. In total: 6 incidents comprising: speeding – 1; information – 2; child protection – 1; abandoned 999 – 1; domestic – 1. Nothing was noted to pass back to the police. Item 8. Secretary’s report. All relevant email correspondence has been circulated. (1) Toilets management. How this is to operate next year must be negotiated with THC. Essential supplies should be provided by/acquired through THC as it can buy in bulk with the obvious savings. The donations box is bringing in money towards costs of the caretaker. Secretary will liaise with Debbie Sutton, THC and THC Councillors. MT Action. Newsletter – £2,842.05; BNO – £13,493.98; EON Path – £170.40. Item 10. Correspondence/Matters raised by local residents. (1) All received emails have been circulated. (2) Air ambulance landing spot. There are enough local areas available. In some cases, patients can be winched into the helicopter above. (2) Carbisdale trails. See Item 5. (3) Seat in front of Oakwood Place. No update available. (4) Wreath laying on Remembrance Sunday. BC will do this for the CC. RP will also attend as a member of the Rotary Club. (4) Community clean-up. This has already taken place. (5) Poling station review. Secretary will reinforce the decision to keep this at the Ardgay Public Hall. (6) Wild land. It was noted that there is a motion being put to Scottish Government to change the status of Wild Land areas as a Planning consideration – giving it similar status to National Scenic Areas. (7) Flow Country. Also noted, as being proposed as a World Heritage Site. (9) Bonfire wood. Via the Facebook page – firewood is available via Fiona Proctor. (10) Playpark slide. The slide has been damaged. THC will simply remove and not replace. Parents will be encouraged to seek funding for new equipment. (11) Blind spot. The plant tubs at the corner beside the Hall have grown and could soon obscure sight lines. BW Action. (12) Royal Mail mailbox. This requires maintenance. To be reported to Royal Mail. BW/MT Action. (1) Planning. Noted that Coul Links application has been called in by Scottish Government. Application by Ardgay Game raised no objections. (2) Newsletter. Issue no 41 is now distributed. It features forty pages and there are new contributors and advertisers. Next deadline is 21st November and the winter edition should be out for distribution around the 15th December. The Editor has received reports of people not getting the newsletter. If anyone is aware of someone who lives in the area who is not receiving a copy, contact the Editor on 01863 766690.
to the size, this application will be dealt with by THC. Item 12. Highland Council. THC Community Council Review. See item 5 (6). The deadline for responses has been extended to 2nd November. (2) At last Sutherland Community Partnership meeting the Children’s Plan was discussed but it does not seem to be accessible anywhere. Item 13. AOCB. (1) Christmas tree. A tree needs to be sourced, also volunteers to help with decorations. It is hoped to erect the tree around the 8th/9th December. 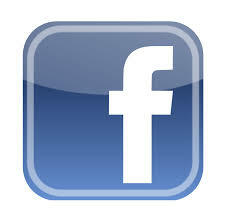 This will be posted on the Facebook page. MT/BW/AW/SM Action. Item 14. Date and time of next meeting. The meeting will be held on Monday 10th December 2018 at 7pm in Ardgay Public Hall. Meeting closed at 9.40pm. Private Session. Beinn Tharsuinn Community Benefit awards. Application by Ardgay Public Hall received an award of £861 to cover costs of maintaining the Internet provision in the hall for the next two years. Application by Royal British Legion Scotland Creich and Kincardine Branch received £850 towards the planned WW1 Commemoration events. MG Action. Meeting closed 9.45pm. List of names given by members of the public attending for Item 3. Items 1/2. Welcome/Apologies (as above). Chair Betty Wright welcomed everyone, especially THC Cllr Currie attending for the first time, DH & PH, then introduced Martin Thomsen. Item 3. Guest speaker: Martin Thomsen, Community Engagement Officer. MTh explained he and two others have been in post, based at Kyle of Sutherland Development Trust Office, since December last year working with the Sutherland Community Partnership towards production of the new Ardgay (and other areas) Local Plan. Five areas in Sutherland have been designated as deprived: Golspie, Helmsdale, Brora, Creich and Kinlochbervie. Questionnaires have been sent to all Sutherland with follow up required. Responses from the five areas will feed into all the others. The main issues being identified are Care/Wellbeing, Children, Public Transport, Employment and Fuel Poverty. This information is an asset to KOSDT and will be available to all local groups. Additional areas highlighted are local economy and employment, Internet provision and housing. Census figures from 2011 show Ardgay and District population as 627. 131 responses were received, approximately 20%. MTh’s team is planning more face-to-face engagement with posters being distributed from 14th August and a workshop to be held in Ardgay Hall on 27th August from 6 – 8.30pm. On the 28th a surgery will be held in the Barn between 12 noon and 8pm with half-hour one-to-one consultations available. Results will be sent to participants. After assessment, conclusions reached will be produced in a final document in October. MTh offered to attend the CC meeting at that time to present the findings. This offer was accepted. MTh to liaise with BW for agenda. Statutory bodies will have no obligations to act on these findings, but the results will be fed to all relevant groups and departments of THC. KC hoped that the new Locality Plan will help to address inequalities and aid better use of resources. AW expressed some concern regarding the methodology of the research/statistics. MTh agreed that this a problem for all service providers. This will provide a representative sample only. The team will try to reach out via the places vulnerable people go, e.g. health centres, chemist, shops, food stop, etc. KC indicated that the results will become a planning tool; it is not a resource tool. Ullapool is good example of Community Empowerment. Local development groups can make good use of this type of information. Chair thanked MTh and this item closed at 8.20pm. Item 4. Minutes of last meeting. The minutes of the May meeting were approved as a true and accurate record, proposed: Marion Turner; seconded: Rob Pope. Item 5. Matters arising. (1) Ardgay/Bonar straight. Plinths are ready. Benches to be installed with one facing each way. The response is negative so far from THC regarding the imposition of a speed restriction. Head of Roads Dept. Graham MacKenzie to be asked what criteria is used to assess the need. Scottish Government is pushing for healthy lifestyles, more active travel – speed restrictions on this section will encourage people to walk/cycle between the villages. As both communities are raising this concern, pressure will be put back on THC to reconsider. A speed count is to be undertaken by THC but evidence from locals must be taken into account. Chair will write to Graham MacKenzie. BW Action. (2) Defibrillators. The project is complete, and an evaluation report has been sent to the funders. The defibrillator seminar and CPR training session was very successful with twenty members of the public attending. It is hoped to offer refresher courses next year. Seven volunteers are now registered in the Community Heartbeat Trust Governance system to give bi-weekly reports on the Public Access Defibrillators (PADS). The devices are included in the Scottish Ambulance database and are ready to be used by members of the public or the emergency services, if needed. (3) Plant tubs. Jean Richardson and Steve Wilkinson are working with the tubs, maintaining, planting, etc. A payment of £100 was agreed to cover costs. MT Action. Item 6. Police report. Received by email during the meeting which mentioned only three incidents: one medical, one domiciliary and one concern for a person. It was unclear if this report referred only to the last month. Item 7. Chairperson’s report. Discussion regarding how to organise meetings and stay within reduced budget led to the decision to reduce the number of meetings per year to six and to try to limit each to one and a half hours’ duration. Meetings to deal with community benefit will continue to be costed separately. THC is commencing a review of the CC scheme. All members are encouraged to respond individually to all communications, deadline end of September, and to attend any workshops/presentations in the area if possible. CC will write to THC to indicate that the timescale is too short to respond as a CC. This is a large and weighty consultation and the timescale leaves no opportunity for CC discussion. MT Action. Item 8. Secretary’s report. All relevant email correspondence has been circulated. (1) Secretary has written twice to Debbie Sutton, THC, regarding payment of funding for the running of the Ardgay toilets but with no response. Checking on whether the payment has been received requires visits to the mobile bank within its specified hours, and the time involved in chasing up. Volunteers should not have to do all this. A&DCC has been running the toilets perfectly well for many years, but now have to operate with £100 less in funding and buy the consumables required. The cleaner attends specifically at times to open and close up the facility. None of this works under the Comfort Scheme. Cllr Currie will take back the issues to THC. KC Action. Item 9. Treasurer’s report. The 24th July 2018 balance at the bank was £16,925.84 of which £16,846.66 are restricted funds. The CC Admin Fund has a balance of £-201.70 and the Windfarm Admin Fund has a balance of £280.88. The balances of the restricted funds are: Toilet Caretaking: £258.25, BTWF Community Projects: £3,811.22, Newsletter: £1,612.81, BnO: £10,993.98, E.N Path: £170.40. Item 10. Correspondence/Matters raised by local residents. (1) All received emails have been circulated. (2) Carbisdale trails work day. Volunteers are required for this; the date is yet to be decided. RP expressed local concern regarding signage at the Castle; one indicating a private road and others covering up the speed bumps warning signs. Core Paths must be accessible. Awaiting a reply from Matt Dent. (3) Siting of recycling bins at The Hub. It is understood that the bins will be re-sited. Chair will liaise with Andy Hume, THC Waste Management. BW Action. (3) Tree planting on Jubilee Hill. Balnagown Factor is aware of the Core Path and archaeology on the hill. No planning application has been made. Secretary will write to the concerned locals. (4) Dropped kerb opposite Ardgay Stores. KC chased up on this today and the work should be done asap. She will continue to monitor. KC Action. (5) Private water supplies. Private water supplies were failing during the hot weather. A statement was posted on Facebook. The drinking water quality regulator has instructed Scottish Water to provide bowsers or bottled water to properties with private water supplies which have failed due to the hot weather. This will be funded by Scottish Government and co-ordinated by local councils. To access this help, contact the Highland Council Environmental Health service point on 01349 886606, state that you require assistance with your water supply. An officer from Environmental Health will then contact you and take you through the process of accessing the help available. (6) Liz Cormack wishes to install a seat in memory of her husband Sandy, on the bank in front of Oakwood Place. THC has indicated that there is no objection. MT will liaise with Liz prior to next meeting when further discussion will take place. Agenda item. (7) DH attended tonight to advise that he is standing down from several boards – HSCHT, VGES and CAB – after having served as the A&DCC representative for ten years. Chair recorded grateful thanks to DH for his commitment to the community over this time and asked if he would write a short piece for the newsletter. While there is no obligation on the CC to be represented at these organisations it is most beneficial to have this involvement. BW suggested that someone with relevant experience, as DH had, should fill this position, perhaps from KOSDT. SM to be asked to have an item in the newsletter. SM Action. KC reported Highland Third Sector Interface (HTSI) is facing a major redistribution of funding with all administration being centred in Dingwall threatening the continuation of the smaller offices in the area. VGES in Golspie would be greatly missed by many groups and individuals who benefit tremendously from the services provided. PH noted that removal of such support for the community flies in the face of the move towards community empowerment being promoted by Scottish Government. Ardgay area so we can assume this is mere conjecture. Society, the National Trust for Scotland and the Scottish Wildlife Trust. its internationally designated conservation areas. Scottish ministerial level. We would urge them to do so. (3) Newsletter. Copy date for contributions and adverts is Thursday 23rd August. It is hoped that the August edition will be distributed during week commencing 10th September. As forecasted in April 2016 a funding application to Beinn Tharsuinn Community Benefit Fund is now needed to complete the three-year project. (4) Broadband. The local project with Highland Wireless is progressing. (5) Windfarms. (1) Chair signed the updated MOU for the SSE/E.ON Achany Panel. (2) CC is still talking with Sallachy in regard to community benefit. (3) Meall Buidhe, Croick, is expected to hold public meetings in Ardgay, Wednesday 19th September 2.30 – 7.30pm, and Rosehall, Tuesday 18th September 2.30 – 7.30pm. (4) Coire na Cloiche is nearing completion of construction phase. A cycle and walking route now exists between Struie and Strathrusdale. (6) Kyle of Sutherland Development Trust. AW recommended the Trust website for news and blog, press releases, group summaries. Much information available. Helen Houston is retiring at the end of September. The post has been advertised. MT enquired as to the whereabouts of the panels which were briefly in place in Drovers Square. They should be replaced. If not, the framework to house them should be removed. Item 10. Highland Council. THC Community Council Review is under-way and all members were encouraged to complete individually. The two-month deadline is impossible for many CCs to meet owing to summer recesses. Issuing the survey at the same time is inappropriate showing that THC fails to understand how CCs work. There has been no prior consultation/liaison. The structure of the Review is important, and THC must make it relevant. Moves to amalgamate CCs is totally impractical in many rural areas which cover large geographical regions. KC and MT will each write to Alison Clark, Acting Head of Policy. KC/MT Action. The item to address GDPR will be added to the next agenda. Agenda item. Item 11. AOCB. None raised. Item 12. Date and time of next meeting. The meeting will be held on Monday 8th October 2018 at 7pm in Ardgay Public Hall. Meeting closed at 10.10pm. Private Session. Beinn Tharsuinn/Beinn nan Oighrean Community Benefit awards. BTWF. Application by Kyle of Development Trust had been approved by email during the summer recess with an award of £1,125 towards Post Office Improvements. Application by Ardgay & District Community Council Newsletter was approved with an award of £2,000 to complete the three-year project. BnO. Application by Kyle of Sutherland Gala Week had been approved by email with an award of £241.75 to assist with running two events during this year’s Gala Week. Meeting closed 10.15pm.